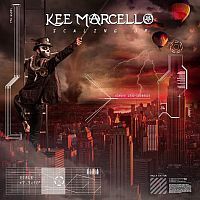 Mattias Eklundh: guitar solo on "Good Men Gone Bad"
Michele Luppi: keyboards on "Wild Child"
Kee Marcello is back at what he does best - Europe fella releases his 4th solo album that is bound to resonate with aficionados of hummable hard rock. Right from the start it is easy to track down where Marcello’s influences come from. They are in fact writ large – classic rock teachings with tasty hooks and a chest pounding chorus here and there – and he actually proves to be pretty nifty when conjuring up said scenarios. His confidence is ever-present; apart from handling vocal duties, guitars and keys, Marcello is also in charge of the album’s production. This decision pays dividends, which means you’ll be happy to discover an album of ballsy fist in the air rock. “Don’t Miss You Much” and “Black Hole Star” are the sort of melodic rock punches we all love, meanwhile, “Blow By Blow” is a terrace chant joy, merging saucy riffs with seriously pounding melodies. Putting guitar skills on the side, Marcello is a quite superb singer who immerses himself completely into such super-flammable workouts as “Scaling Up”. His voice continues to tantalize as he revisits Europe with “Wild Child” and “Don’t Know How To Love No More” – both of which get a topical facelift. There’s much here for classic rock fans to enjoy.